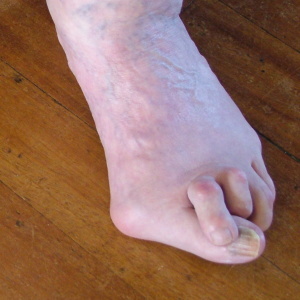 A bunion is a condition affecting the bones of the big toe. The toe itself points outwards, towards the second toe. The metatarsal bone on the other side of the big toe joint points inwards. Together, they result in a prominence of the bones at the level of the big toe joint. The big toe can push the smaller toes sideways or underride the second toe, as shown on the left. Bunions run in families. If your mother or father has a bunion, you are susceptible to developing them too, and this can even occur in childhood. The type of shoe that you wear may make this problem manifest itself earlier. High heels force the toes into the front of a shoe and this can mould the big toe and the little toe to form a bunion and bunionette ( a bunion of the little toe). During middle age, imbalances in muscles can cause bunions to get worse. The big toe joint surfaces may no longer be congruent and this can lead to arthritis eventually. If the second toe is pushed up by the big toe, the second toe rubs on shoes and forms a hard area of skin. 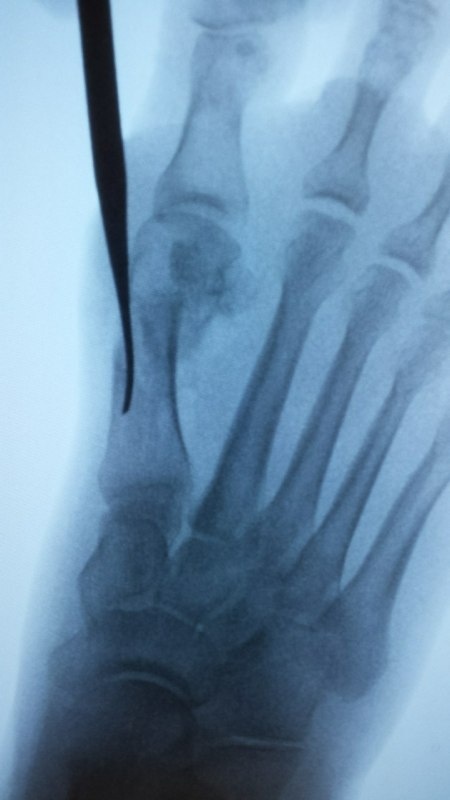 If you have a bunion, it is best to see an orthopaedic surgeon who specialises in foot and ankle surgery. You should have xrays taken in a standing position – this is when the deformity is worst. It is also the position that your foot adopts in your shoe. If your bunion is causing you pain, rubbing on your shoes or preventing you from wearing shoes, then surgery is a reasonable option. If you don’t have any symptoms, you should not have surgery until the bunion is causing you problems. There are risks associated with surgery – see ‘what your operation involves’. Unless you have symptoms, it is not worth taking these risks. An alternative to surgery is considering broad fitting shoes, but most patients have tried this before considering surgery. Insoles will not help your deformity and elastic socks and taping will not reverse the deformity. The type of surgery that you have depends on the severity of your bunion. 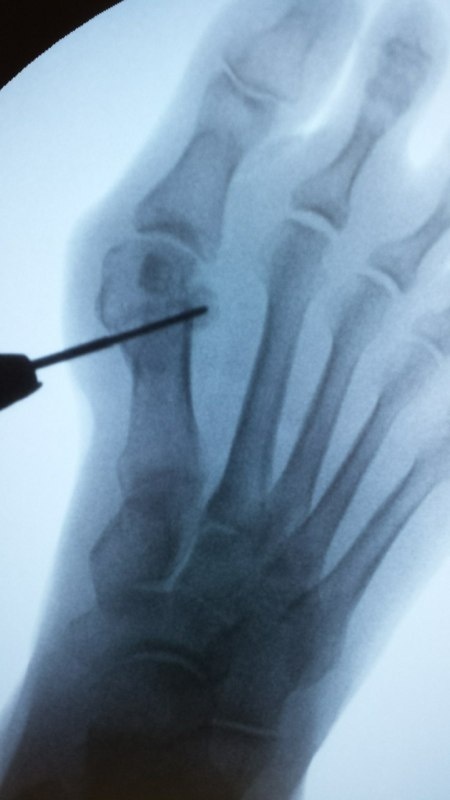 Bunions are due to malalignment of the metatarsal bone, so the metatarsal is cut, realigned and then held in the new position by some screws. 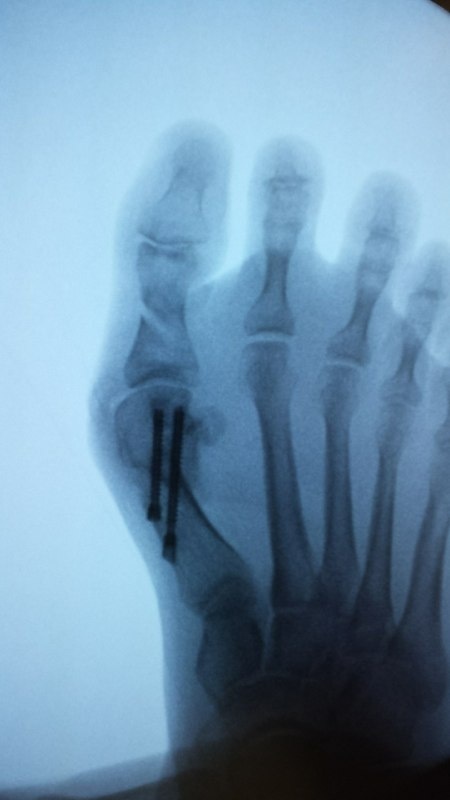 Almost all bunion surgery requires that the metatarsal bone is broken, whether this is performed through a keyhole approach or a more conventional open approach. Most types of bunion are amenable to keyhole surgery. The short incisions made for keyhole surgery are only 3mm long. 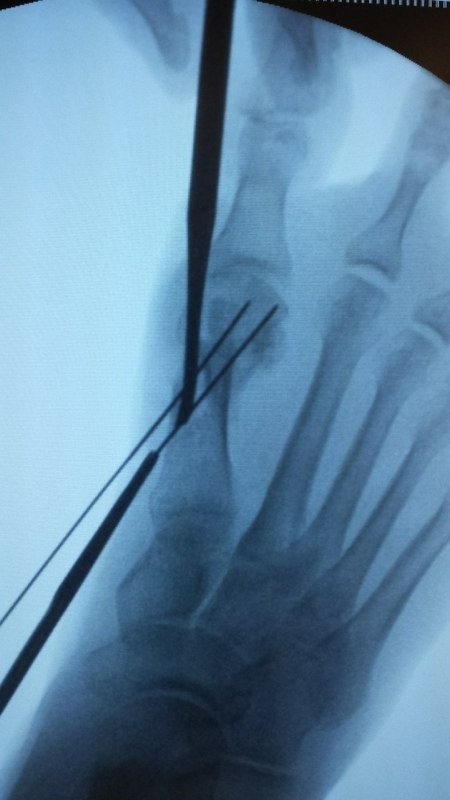 This keyhole allows instruments to be passed into the bone to cut the bone and release soft tissues. 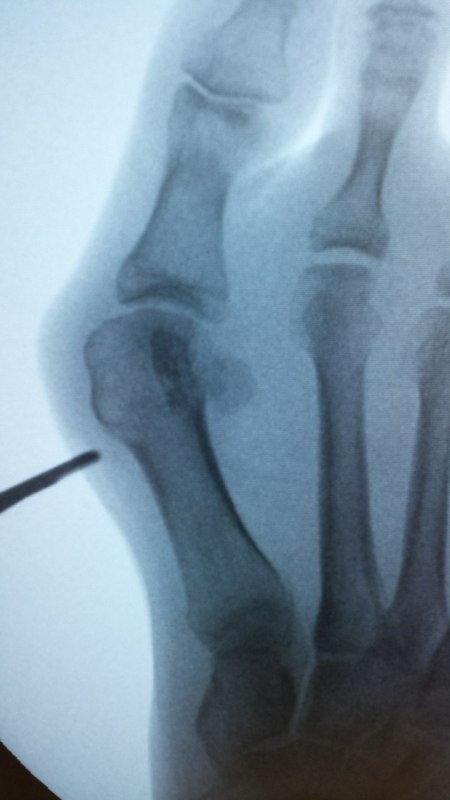 Holes are made for screws to be passed through the broken bone to hold the new position. Whenever bone is cut, there is associated pain, bruising and swelling. This can be reduced by keeping the foot elevated above heart level after surgery, and by regularly taking painkillers. Keyhole surgery results in less soft tissue trauma, and can lead to less swelling, and more rapid resolution. Six weeks are spent wearing a special postoperative shoe – the first two weeks after surgery, the shoe must be worn day and night for your protection. After the first two weeks, the shoe is worn only for weight bearing. After six weeks, if the xrays are satisfactory, the shoe can be discarded. If there are technical problems in surgery, then I may fall back on an open approach, although this is a rare occurrence. 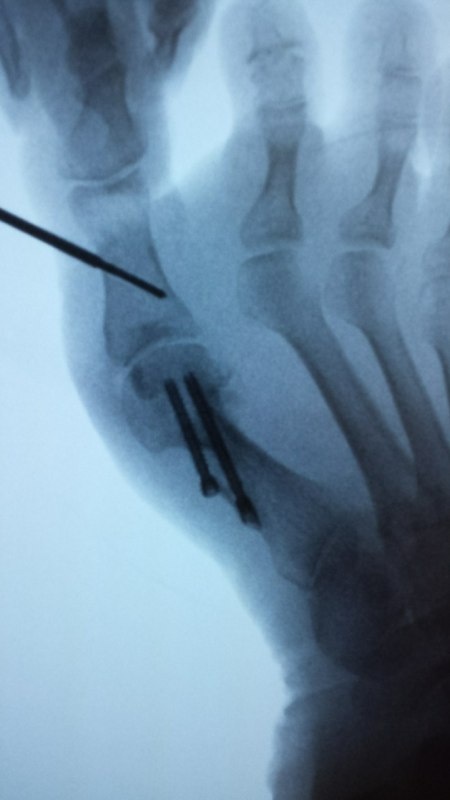 Please read about the anaesthetic and surgical risks from forefoot surgery. If you are having keyhole surgery, you may also wish to read the 2010 NICE guidelines on the use of minimally invasive surgery, although many would consider these now as out of date, and requiring re-assessment. After surgery, you will have the foot bound in thick bandages. It is normal to expect some bleeding after surgery, and this may stain the dressing, but the dressings should not be removed as the dressings will decrease the bleeding and provide a sterile environment to decrease the risk of infection. At two weeks, the dressings are taken down, and the foot can be bathed if the wounds have healed satisfactorily. Exercises to keep the big toe moving can also be commenced. It is normal to have swelling after surgery. After open surgery, it is common to have swelling six or even nine months following surgery. After keyhole surgery, this may be less prolonged.